Truth be told – I’ve been checked out of baseball during my adult life longer than I’ve been checked in. I remember the days in Wisconsin when I’d wait for new baseball cards like I was waiting for a child to be birthed. My friends and I would go to the local police station and, for reasons unknown to me; they would always have the new Brewer cards. I think growing up during the late 80’s – early 90’s it was still kind of kid mandatory to enjoy baseball, wait no… to love baseball. Our parents were coming off the days of sandlot pick up games and being fans of old school traditional players so it’s to be expected that their tradition was passed along to us. Also growing up in a smaller city and community put more pressure to love your hometown team like you were actually helping them win – the ultimate fan. …And for a hiccup of time, I was the ultimate Milwaukee Brewers fan. Over time, I faded from my baseball love and started to like other teams, it didn’t help that the Brewers were seemingly a terrible team ever year and I was more interested in doing anything else than watching them. It also didn’t help that Brett Favre joined the Packers and took over Wisconsin in about 5 minutes, Wisconsin and myself suddenly became complete and totally football by 1997 - it was as if I had forgotten to be a Brewers fan. Yeah, you were cheering because they were winning…. Robin’s Yount 3,000th hit: I was at this game and the Dude rode a motorcycle on the field with that huge stalker mustache. Who could get away with that now? Paul Molitor doing anything: Sure he was coked up all the time but he was still a great player and watching him and Yount doing their thing was like Barry Bonds and Bobby Bonilla minus the Homeruns and … er…. That’s it. County Stadium: I loved this place. This stadium had such a blue-collar beer drinking vibe to it with so much history they had to go and tear it down. Seriously, this place had an area called “Vaughn’s Valley” Where Greg Vaughn would jack home runs every day and everyone would celebrate by throwing beer into their mouths. Miller Park: Lots to remember of Miller Park in its short history. For starters the fact that a huge blue crane fell on it, which ultimately delayed the completion by about 2 years but more importantly it took the lives of 3 workers. This stadium was a big change from County Stadium because it had the retractable roof. I remember sitting with my Dad long after a Brewers vs Cubs game waiting - we caught wind that they were going to close the roof… this was both the first time either one of us saw a roof close on a stadium. Bernie Brewer: The Mascot… the lame Mascot. Mark McGuire batting practice: What does this have to do with The Milwaukee Brewers? Nothing really, but a group of my friend stood in the Miller Park parking lot while McGuire was juiced up on steroids during his record season. The guy literally hit balls out of the stadium – it was insane. Tailgating: What good is anything in Milwaukee without tailgating? This actually is my favorite part of games – drink – hang – drink – eat – drink – talk – drink – and forget why you’re in the stadium parking lot. Bob Uecker: The Uecks! I think he’s still the play by play guy for the Brew Crew. Either way having Bob do play by play always made me feel like we had a celebrity announcing the game and at any given moment he would introduce Wild Thing Ricky Vaughn. Which reminds me…. Major League: Shot at Country Stadium, Milwaukee’s 11th claim to fame. That Logo: Find me a more brilliant logo than the one above. You can’t. The 2011 Brewers: The team that almost got me back into baseball. 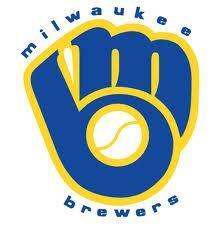 I’m extremely happy for The Brewers and for the memories, and to all you fair-weather fans like myself…. Hope to see you next season.